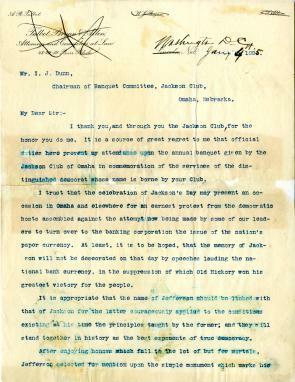 In 1895, Williams Jennings Bryan wrote to I. J. Dunn, an Omaha lawyer and president of the Jackson Club, to decline an invitation to speak at the local Jefferson-Jackson Day dinner, an annual event held by the Democratic Party. Bryan, a politician from Nebraska, was already a national political figure who had served two terms in the House of Representatives (1890 and 1892) and would win the Democratic nomination for president of the United States in 1896. His letter expresses his political beliefs and draws upon the ideals of Andrew Jackson and Thomas Jefferson. Of the self-evident truths set forth in that immortal document the declaration that “All men are created equal” is the most important because it is the most fundamental and comprehends all the others. Its application now would solve aright the questions which vex the civilized world, and would both remove the abuses of legislative power encouraged by our own government and add to the laws we now have such additional statues as are necessary to protect each citizen in the enjoyment of life, liberty and the pursuit of happiness. A PDF copy of Bryan's letter is available.